Angel trumpet plants are easy to care for and grow. You can take the small start of your angel trumpet plant to grow outdoors or in a container. The angel trumpet, also known as Datura or Brugmansia, is a beautiful plant with extremely sweet-smelling blossoms. The flowers open during the night and remain open until the sun shines on them. If you live in zones 9 through 11, you can grow the angel trumpet starts outdoors. In zones 8 or lower, you will need to grow your plant in a container. Bring the plant indoors when the weather turns cold. Choose a place that has part light shade to full sun. Although the angel trumpet loves the sun, it does better with some shade during the hottest parts of the day. Dig a hole that is two times bigger and two inches deeper than the container your angel trumpet start is growing. Mix the soil with equal amounts of compost. Angel trumpets love a rich soil as it helps them to grow at a fast rate. Plant the angel trumpet in the ground and fill the hole in with amended soil. Tamp the soil lightly around the plant to remove air pockets. Water the area well. Keep the area well-watered, but not soggy. The angel trumpet needs the extra moisture in order to grow. Fertilize your angel trumpet with a general purpose fertilizer every two to three weeks during the growing season. Just before the angel trumpet is going to bloom, switch your fertilizer to one that has a high phosphorous formula. This will help the plant to have beautiful blooms. Weed the area or add a layer of mulch to help deter weeds from growing. This will also keep the moisture in the ground. Cover the angel trumpet with a blanket or tarp if a frost threatens. If it freezes, the angel trumpet can usually come back. It won’t survive repeated frost. If you live in zones 8 or lower, you will want to plant your angel trumpet in a container. Choose a big container that will contain this fast growing plant. You need one that is well-balanced for the plant to grow in so the wind won’t blow it over when you take it outdoors during the warm summer months. Make sure the container you choose has drainage holes at the bottom. Cover the drainage holes with shard. Fill the pot with well-draining potting soil or mix equal parts of soil, peat moss and perlite. Leave at least an inch of space between the soil to the top of the pot. You will need the extra space for when you water. Fertilize with a 17-17-17 type of fertilizer. Do this every two to three weeks so your plant will have numerous blooms. Mix 3 Tbsp. ammonium nitrate (34-0-0) to 2 gallons of water. Give this to your angel trumpet early in the spring and again late in the summer. This will help boost the plant’s foliage. 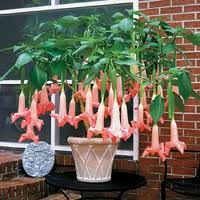 Place your potted angel trumpet outdoors during the summer. Pick a place where it will get some shade during the hottest part of the day. When the temperatures begin to grow cold, bring the plant indoors and place in a south facing window. The angel trumpet has limbs that easily break. Prune the angel trumpet when the main trunk forms the first "Y" to encourage more blooms. Prune the older branches or stems to encourage your angel trumpet to grow more branches. The angel trumpet usually needs watering once a day or sometimes more. If the leaves begin to droop, that probably means that it needs more water. All parts of the plant are toxic to people and animals.